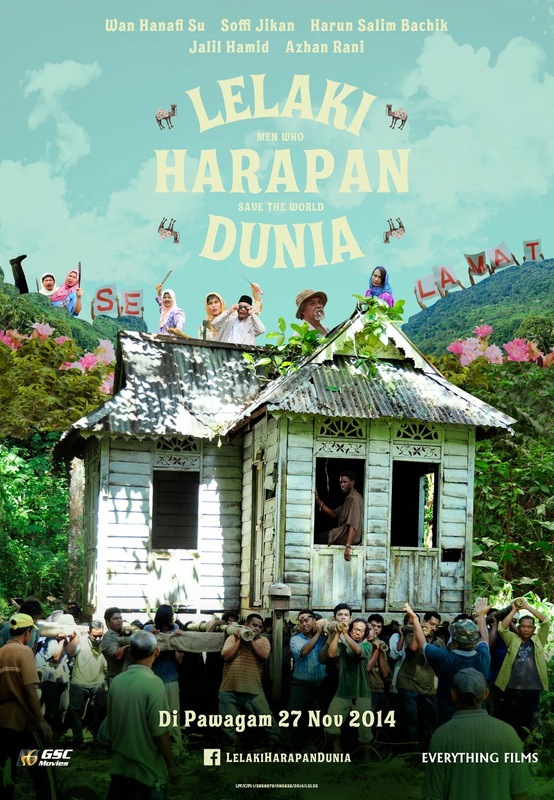 Multi-film festival invitee LELAKI HARAPAN DUNIA opens in Malaysia 27 Nov.
UPDATE: My review on this film is now available. To read it, click here. After being selected to compete at the 67th Locarno International Film Festival (Switzerland) in August, Lelaki Harapan Dunia was invited to a number of other renowned film festivals around the world – Toronto International Film Fest (Canada), Nara International Film Festival (Japan), Busan International Film Festival (South Korea), Golden Horse Film Festivals and Awards (Taiwan), just to name a few – and has since been receiving mixed reviews from the critics. Soon, we Malaysians will be able to watch the local comedy on big screens and judge it ourselves. Directed and written by Liew Seng Tat (multiple award winner for his debut film Flower in the Pocket), the story of Lelaki Harapan Dunia sets in a quaint “kampung” where its villagers are uniting to help Pak Awang (Wan Hanafi Su) to physically carry an abandoned house from the jungle into the village as a gift for his daughter who’s getting married. Unexpected incidents begin to happen when an illegal African immigrant comes across the house and decides to hide in it. Believing that the “black shadow” one of the villagers saw was a ghost, they fear that the relocation of the house has enraged the devil. A series of wild mishaps befall the village lead to false accusations, hilarious situations and ‘ingenious’ actions to protect the village from ‘danger’. The Malaysia-Netherlands-Germany-France production will be joining four other comedies to be released on 27 November 2014, three of which are two sequels and a spinoff from Hollywood (Penguins of Madagascar, Horrible Bosses 2, Dumb & Dumber To). It’s a tough competitive week to be releasing a comedy but if Lelaki Harapan Dunia turns out good, Malaysians should probably give it a chance.